The FBI-SOS (Safe Online Surfing) Internet Challenge is a FREE, online, educational program available to public and private schools nationwide. Designed to meet federal and state internet safety mandates, students take web-based quizzes and complete an online Scavenger Hunt to learn important internet safety and cyber citizenship concepts. 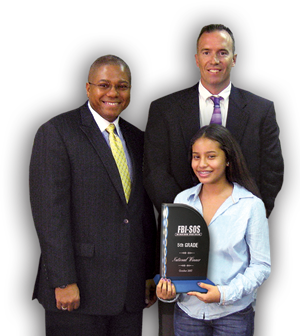 At the end of each month, the FBI-SOS National Trophy is awarded to those schools with the highest scoring students on the FBI-SOS Post Quiz. A matching reward goes to a very meaningful cause.